New OC Technology Makes Cell Extractions Easier, Safer & More Affordable. Safely controlling enraged and combative inmates during a cell extraction is a difficult task corrections officers (COs) encounter on a regular basis. Administering OC (Oleoresin Capsicum) has proven to be the ideal tool, providing CO's with an advantage during dangerous scenarios, such as: an inmate blocking the OC delivered from standard aerosols by covering the food slot, or, a common technique in which the inmate vertically lodges his mattress in front of the cell door. Challenging situations require a special product that gives COs the upper hand. Security Equipment Corporation's SABRE Red Cell Buster? is the ideal cell extraction tool. The Cell Buster consists of a large but highly portable MK-9 canister equipped with a hose and wand attachment. This innovative device delivers up to six, three-second bursts of SABRE Red fog into the cell. The fog provides a powerful Level III contamination, delivering 10% OC measuring 1.33% major capsaicinoids. Superior to traditional OC options, the SABRE Red Cell Buster's Level III capsaicinoid content combined with its heavy fog delivery does not require a direct facial application to incapacitate. Incorporated with built-in safety systems, light weight portability and backed by independent health studies and cost effectiveness, the Cell Buster quickly ends dangerous situations with less staff involvement. 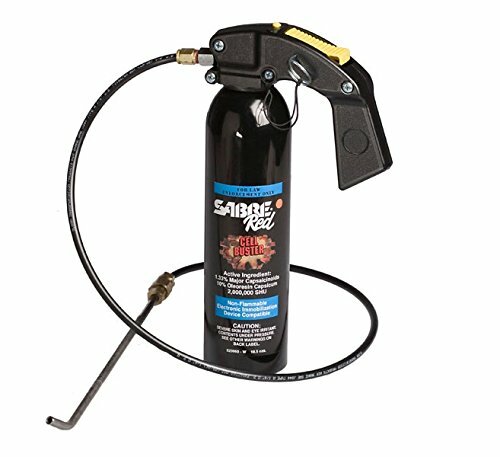 With the addition of the SABRE Red Cell Buster, you'll escalate your aerosol projectors, not your level of force. Reduce injuries and "hard entries" with the SABRE Red Cell Buster - the ultimate cell extraction device. Reduce the need for "Hard Entries"!